1. Start small, think big. Choose time appropriate projects. Don’t try to organize your entire kitchen if you only have two hours available to work. Instead, choose smaller projects that you can start and finish in the time you have available. For example, if you have two hours, consider cleaning and organizing the refrigerator. Toss out expired or unwanted food. Wash produce and meat drawers, wipe down door bins, shelves, and side walls. Put remaining food back in place. Keep in mind how much time you have available for the next project, and then begin again. 2. If you haven’t used a utensil or kitchen appliance in the past year, chances are you won’t. 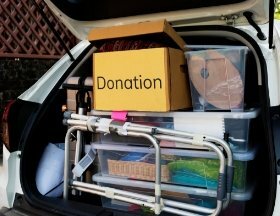 Rather than simply storing it, release those items to someone who will use them or donate them to a soup kitchen or your favorite charity. 3. Organize your cabinets and cupboards so that whatever you use most often is kept within arm’s reach. 4. Stop overbuying. It’s easy to get caught up in the “it’s a good deal” mindset. If you end up tossing those items out, it was the opposite of a good deal and you’ve had to store it! Be a mindful consumer. 5. Getting organized is a project. Being organized is a lifestyle. Do a little bit each day and soon you will enjoy an organized and tidy kitchen! Need help organizing your kitchen? Need help organizing other spaces in your home? Give Andrea Brundage a call today to schedule your organizing session.